Everyone who lives or moves to Calgary wants their home to be surrounded by a well-planned out and beautiful looking landscape. The problem for most homeowners throughout Calgary is they don’t have an unlimited supply of nice and sunny weather or an unlimited supply of money so they need landscaping ideas and solutions that make can make a big visual impact on their property, without making a deep dent in the bank account. Landscaping your property almost always offers an excellent return on investment (contributing as much as 20% of a properties overall value!) but what if your budget for landscaping is only $10,000 or less? So…. When making small investments into landscaping your Calgary property you want to make sure that your choices are going to make a BIG contribution to the overall appeal and value of your property, so where you spend that money can make a HUGE difference! Here are a few Landscaping ideas for homeowners looking to spend less than $10,000 but still want to make a very meaningful transformation to their landscape. Sometimes it’s the little things that make the most difference. There is no sense spending a bunch of money on your landscaping until you know exactly what you’re working with. For many properties (especially if it’s been a rental or neglected) this means a total yard clean up. Getting trees and shrubs pruned up and uniform and preventing them from touching your house, cleaning out the garden beds of all the debris, collecting and removing all the fallen leaves, mowing and edging the lawn, there is no end to the amount of property maintenance that most homeowners in Calgary face. Often times the work starts to get away on us which just makes the problem even worse as the weeks and months go by. Property clean ups usually involve a small crew with a truck, dump trailer and some basic lawn and garden power and hand tools. Property clean ups are usually in the $500 – $1500+ dollar range but it really depends on how much work is going to be involved and how big the property we’re cleaning up is. 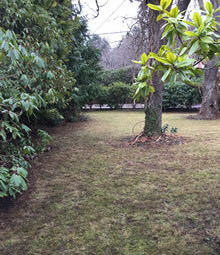 A large property with an intricate landscape that has been neglected for a few years could be a much larger project. #2. Have You Considered a Privacy Hedge or Fence? A Mature Hedge Contributes To Property Value. Increasing privacy usually increases the value of your property too. Hedges make an excellent investment into any residential landscape and they increase your property value as they mature and fill out, offering the looks (and privacy) that make them desirable in a landscape. The downside to a privacy hedge is that they aren’t an “instant fix??? 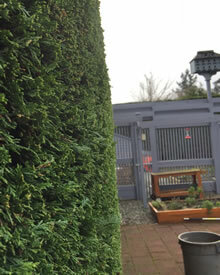 it can take a few years for your hedge to reach a desirable size that offers the privacy you seek. Hedges also need to be watered regularly (usually with an irrigation system) and trimmed and pruned annually or they will not grow thick and healthy. For home and property owners that don’t want to invest the time into their privacy then fences are another solution. 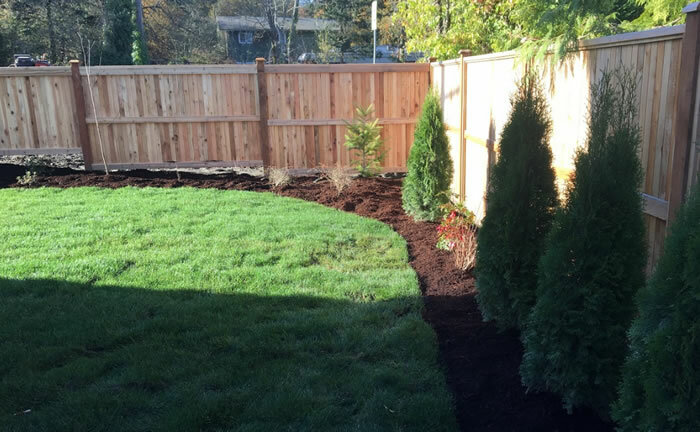 A decorative wood fence enclosing your backyard or as a divider between two properties can be built relatively quickly and depending on your property size, fairly inexpensively too. Decorative wood privacy fences are usually billed by the linear foot with special items (such as gates or clearing brush) adding to the cost. Depending on your property size and the materials you’ve chosen most small to mid sized properties in the Calgary area could expect to spend somewhere between $3000-$10,000 to have a nice, custom wood fence constructed or much more if you’ve got extravagant tastes and a very large property! New Lawn & Irrigation System. Is a beautiful, lush, green lawn in your plans for your dream landscaping? Restoring an old, dead section of your lawn, replacing the entire thing or even installing a new lawn where you never had one before is all possible with the budget we’ve outlined above. For many average sized properties in the Calgary area it’s often surprising to the homeowners how affordable it is to have a new lawn installed. Turf or Sod is the most popular option because it’s affordable and literally gives you beautiful, lush, green grass in a matter of days! 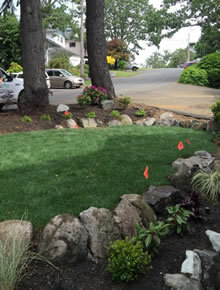 After your property is graded, a lawn soil mix is spread down and we’re ready to roll out your new grass! Turf (we use Kentucky Blue Grass) is estimated based on the square footage of the property and the amount of prep work and labor required to install it. If you’re working with a $10,000 budget then a beautiful new front and back lawn might not be as far out of your reach as you thought! Why Choose Essential Property Maintenance For Lawn & Landscape Services in Calgary, AB? When you choose Essential Property Maintenance to provide lawn care and landscaping services for your property you are partnering with a local small business and a team of professionals that care about the appearance of your property just as much as you do. You can count on us to deliver the services we promise, when we say we will and for a price that is competitive and fair. We’ll do our work professionally, efficiently, and with unbeatable customer service. You’re in good hands with us! If you’d like to receive an estimate from Essential Property Maintenance for landscaping or lawn care services please give us a call (403) 830-3872 or fill out our contact form and we’ll get right back to you to schedule a convenient time for your consultation.